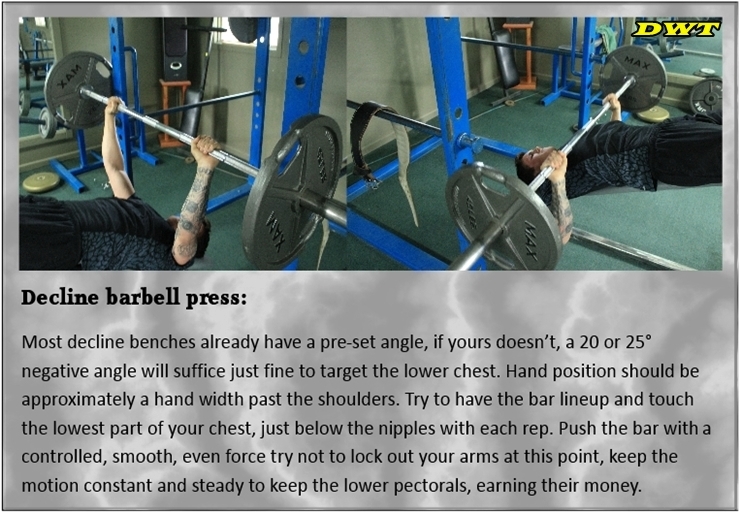 The Building Chest size article covers a lot of ground, including pectoral anatomy, barbell and dumbbell training strategies exclusive to free weight training, as well as exercise point training to help you chose the right movements for your total chest development. Having a thick, broad-based, well-shaped chest of stone, immediately shows others your level of seriousness and discipline towards your training. Thick pectorals get noticed on all athletes! The chest along with the upper back epitomizes the coveted athletic upper body V-shaped look! Building chest size breaks down to three major components. First:like all major muscle groups, the pectorals need (stress) in order to grow in strength and size. Second: the right multi-joint exercises should include flat, incline and decline barbell/dumbbell fly and pressing movements. Third: a full range of motion in the exercises with close attention to strict form is Paramount for all natural lifters. Going through the motions of the exercises and not focusing on intensity and subtle details with wrist and hand position often produces only small results in your chest development. 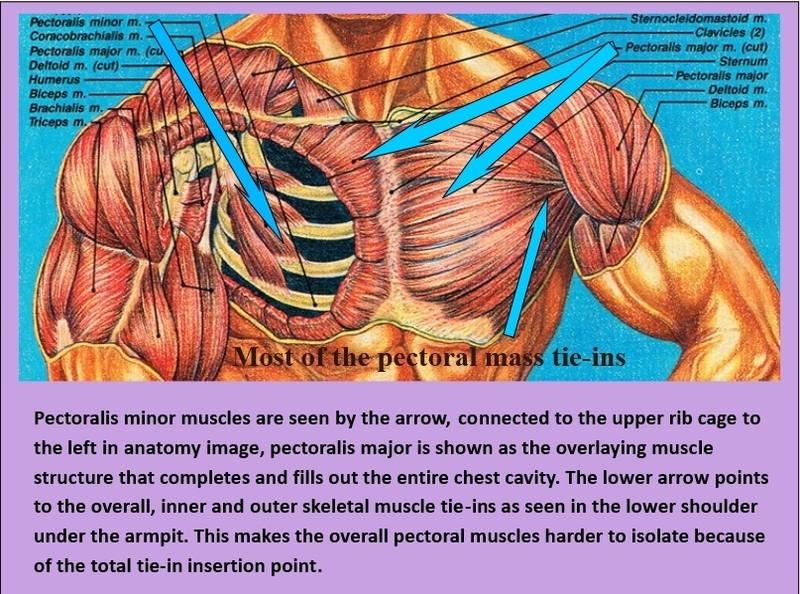 The muscles of the pectorals do not contract the same as other muscle groups with similar exercises. The two major assisting and stabilizing muscles that engage first; with most pressing pectoral-based-movements are the front shoulders and triceps. Engaging the chest muscles and keeping them engaged throughout each exercise movement is the key component in building a large, wide, symmetrical, chest cavity. Building chest size: is stimulated the most from pressing movements, angle, form and bar placement are the deciding factors of where the stimulation will be pinpointed. 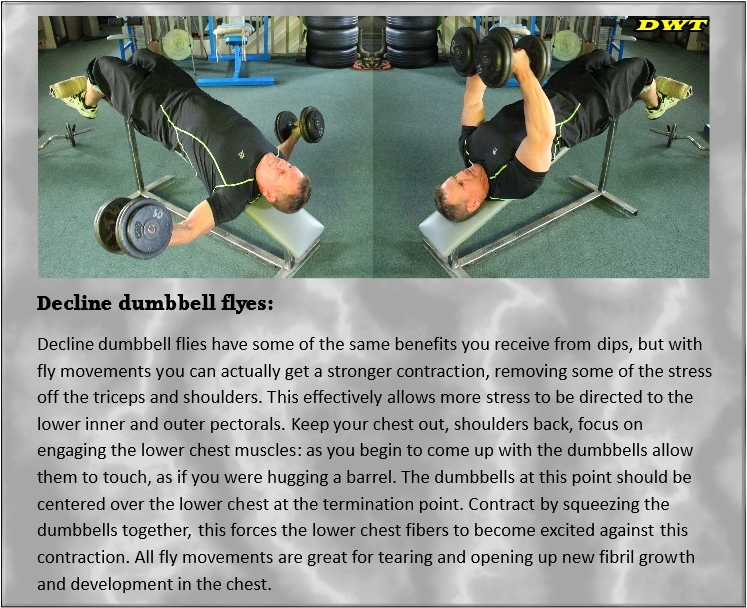 Sculpting: Performing dumbbell and cable-based fly movements keep the stimulation on the pectorals and off the triceps. 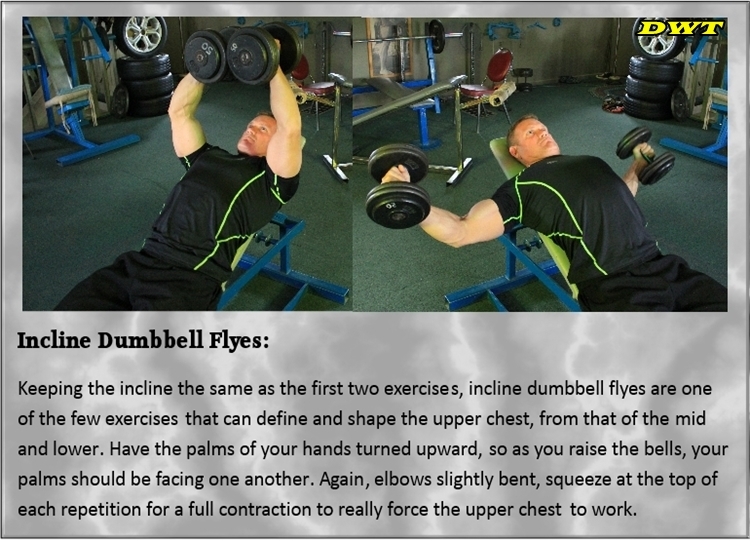 These exercises add shape, separation and refine the look of the pectorals. Fly movements typically open the chest cavity, unlike pressing movements. 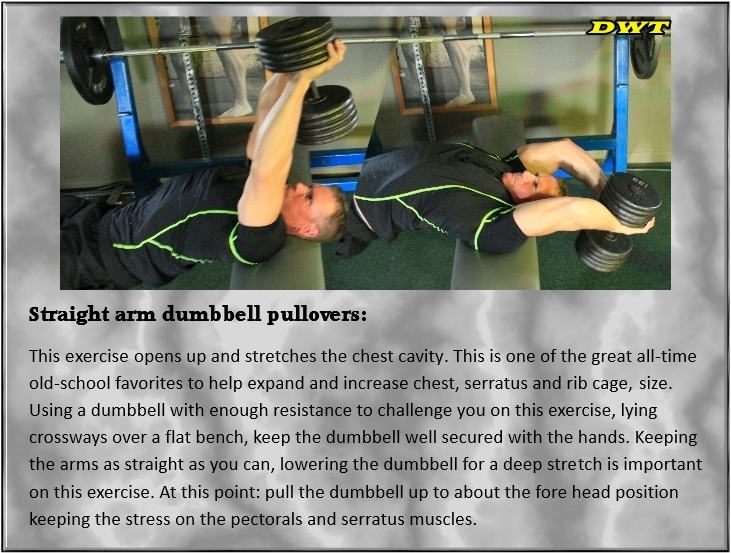 This excites, stretches and expands the pectoral fibers while increasing strength and coordination in your lifting curve. At the end of the day all chest training exercises work to varying degrees depending on age, athletic ability and lifting level, your intensity, and attention to nutrition all play a considerable role in the outcome of increasing your ultimate chest size. Having a regular routine like many countless lifters do and not forcing the pectorals to really contract throughout each exercise, means: their should be very little that's routine about building a large chest! Change should be added to all aspects of pectoral training, being to routine can be the culprit responsible for guys not being able to fully develop the pectorals. Understanding the pectoral muscle structure and the exercises needed to increase your over-all chest size, is a great place to start your knowledge base. Without going into a heavy anatomy lesson, the flat Pectoral major originates as the broad over-lapping portion that makes up the majority of the pectoral cavity. As you can see the majority of its insertions are shown by the lower arrow the underlying Minor muscles make their attachments to the top four ribs, next to the shoulder joint. Hand or grip placement: a wider grip (beyond shoulder width) with the barbell, essentially works the outer part of the chest. Shoulder width-or just inside, commonly works the inner part of the pectorals. An Incline angle, of 20 to 30° works the upper portion of the pectorals. Building Chest Size isn’t About Genetics as Much as Some Believe! (limiting your range of motion), using to much weight, preforming partial reps or failing to lower body weight or resistance enough for a deep felt stretch, or failure to contract at the top of the movement, has many limiting factors in today's modern chest routines. Limiting your range of motion puts limitations on total pectoral development. 'Isolation or emphasizing' exercises are not as necessary! Using free weights, e.g., barbells and dumbbells with alternating angles while controlling resistance should be the main focus at this stage. Simply put: free weight movements = more pectoral mass than incorporating machines or cable exercises. Increase strength first: as that increases, so will muscular size, then you can move to refining-movements. First: challenge yourself with multi-joint pressing exercises, these are (shown further down), for developing and building chest size. Second: develop good form, learn what exercises work best for your strength and lifting curve, this helps balance and coordinate lifting technique that ultimately builds confidence in athletic ability. Third: As your strength increases, continue focusing on building chest mass to increase overall pectoral cavity thickness. Flat Barbell Bench Press, Is This Exercise For Everyone? 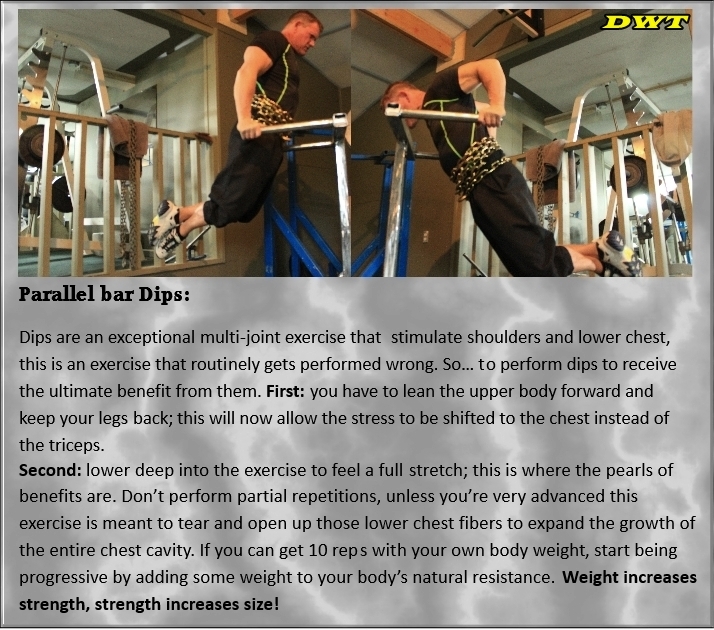 Many of the great traditional multi-joint exercises are essential in building chest size. But, the mechanics of how each of us lifts or presses can vary, from genetics to natural athletic strength and ability. If you have ever injured your shoulder, elbow or have developed other joint problems, this can make some of the more traditional lifts tougher, more specifically: the flat barbell bench press. In other words - the bench press is just another exercise. The shoulders have the ability to articulate over a wide range of motion which can invite injury if you don't treat them like your best friend. This muscle group will be the most responsible for assisting in big pectoral development. Going heavy on the flat bench is not for everyone-go at your own pace and respect your joints and lifting level, if you don’t; your body will probably remind you! Bench pressing naturally comes easier to some than for others, genetic triceps and shoulder tendon strength all play a large part in how steep or shallow your natural strength curve will increase. I found some guys that were really strong at the bench press often had shallow chest development, while other guys who weren’t as strong on the bench press, sometimes had better pectoral development. It's not how much weight you use, its about how you use it! I’ve trained on the bench press with hundreds of different guys, including some who really knew their stuff and were exceedingly strong at pressing. Personally, I admit I am not; this doesn’t mean this forces you into the genetically un-gifted. It merely forces you to re-evaluate your strength curve by learning different ways to increase your limits; choosing exercises that ultimately maximize you’re lifting and development results. Driving-me to experiment a lot more with bench angles and dumbbells. 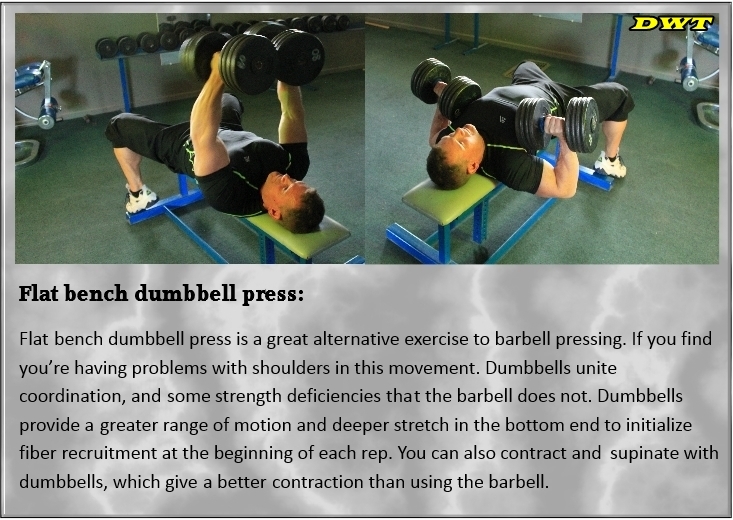 It is true, you cannot lift as much with dumbbells as you can barbell benching. But.. The chest is a muscle group that is overshadowed with heavy assisting muscles as mentioned with the shoulders and triceps. So the million dollar question begging to be asked might be... Do you wanna big Ego or Big chest? Lets check out some of the different training angles and movements with performance explanations to amplify your results in building chest size! Stimulation is the key, not so much the weight, squeezing, contracting and fully ranging your motion (not partial reps), as far as you can, just short of locking out; constant tension and changing angles are the major game changers in building chest size. 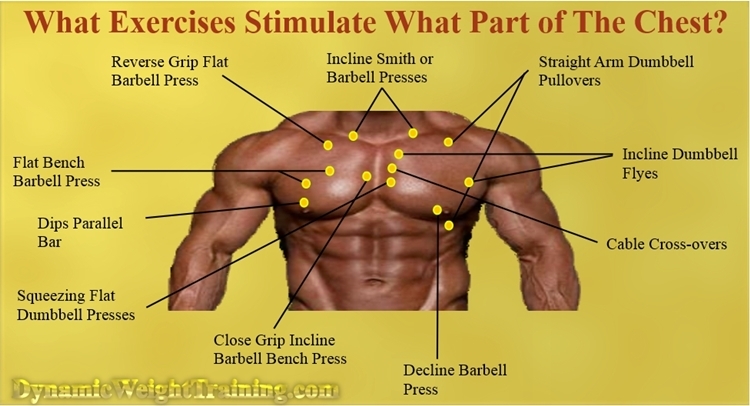 Pressing exercises: are the big boy exercises most responsible for adding strength, and width to the pectoral muscles. 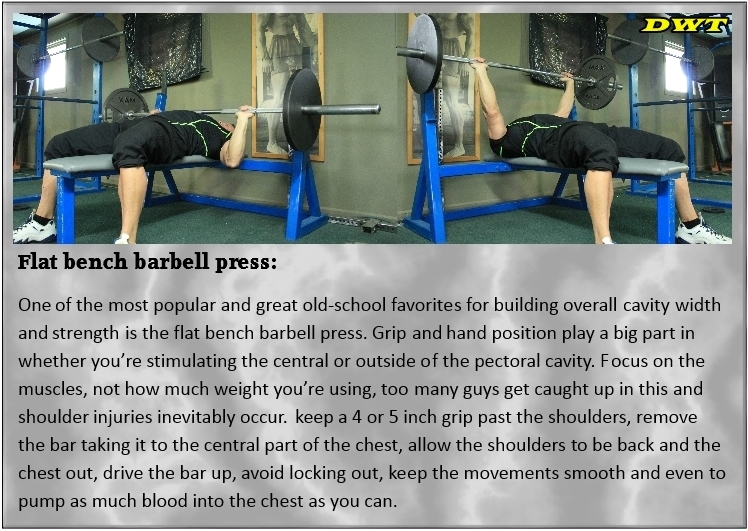 Barbell, Dumbbell bench presses basically come in three distinct flavors of flat, incline and decline movements. The assisting muscles in chest exercises predominately come from the front or posterior shoulder muscles, the big push muscles are the triceps. The triceps and shoulders come into play exceptionally on the biggest majority of pressing exercises. The reason the emphasis is put on big broad multi-joint exercises like flat, Incline and decline bench press is: these exercises are designed to increase strength, like all muscle groups, first: you have to increase your strength in order to build chest size. Adding enough weight to challenge yourself with these movements, while keeping good lifting form produces a chemical release of: (growth hormone) often released as we sleep, acts as a fountain-of-youth each night, repairing training stress. Hand position: on the bar can also dictate where you want stimulation to be felt. A shoulder width grip with the barbell is going to put some of the stress on the central interior of the chest. Having a wider grip meaning: beyond the shoulders is going to force more of the stimulation to the outside, which in turn eventually if you keep at it, builds the overall strength and width of the chest. Arms extended closer to the trunk, as seen above pressing at a (decline angle) stimulates the lowest part of the chest. 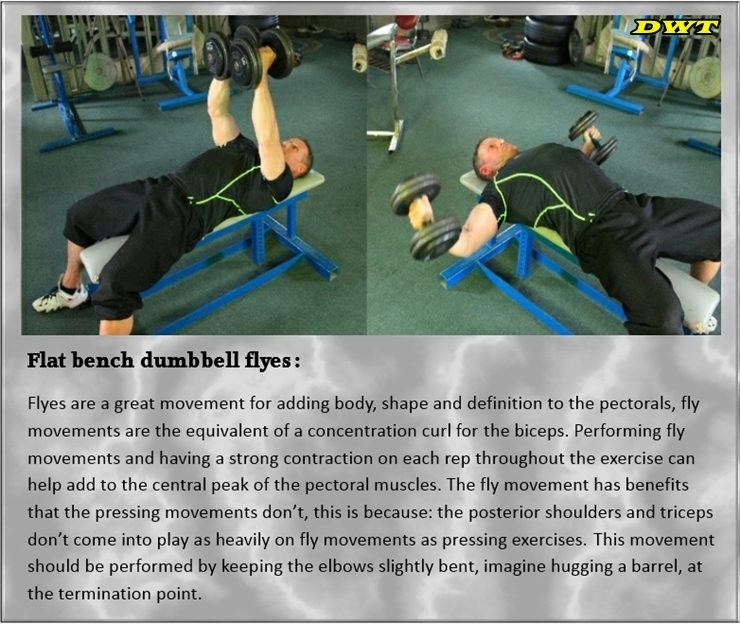 Arms extended to that of 90° from your trunk, depending if you’re performing flyes or pressing movements as in (flat benching) stimulates the entire outer-width of the pectorals. 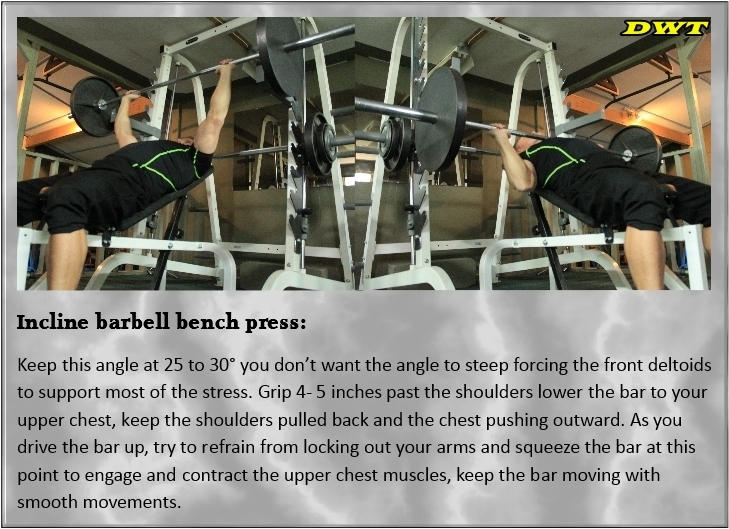 Arms pressing at an (incline) bench angle at 25 to 35°, will be commonly forcing the stimulation to the upper part of the pectorals and shoulders. If the bench angle is too steep, the front deltoids will begin to rob to much of the resistance meant for the upper chest. The word (Isolation), isn't really the most accurate term to use to describe chest exercises to target the different areas of the chest. It's tough to isolate the chest specifically, changing angles directs stimulation from the exercise to the areas you want to affect the most. 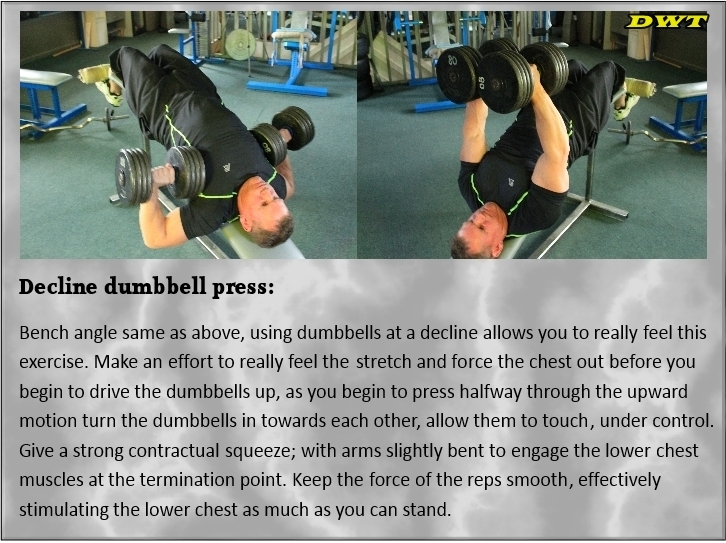 The word “Emphasize” is probably a more appropriate word to describe upper, lower, inner-outer and angle related chest exercises to target the different areas of the chest. If you have been training consistently for a good year or more as an intermediate or advanced level lifter and struggling to increase your chest dimensions: prioritizing is the name of the game in building chest size! The lower part of the chest generally is the most naturally developed part of the chest cavity. The inside and upper portion of the pectorals are usually viewed as the more stubborn areas to develop. Emphasizing different angles, intensities with cable and dumbbell movements can help remedy this problem. This is not the place to throw in the towel, this is where you need to get specific, be stubborn and stay focused on your form, squeeze with each rep to initialize the pectoral fibers from the other assisting muscles! If your struggling with your chest development changing the game of increasing and building chest size has to be re-thought. New emphases with different angles and intensities to pinpoint the areas you feel are the weakest; is the new mental approach to focused on. Most body parts seem to continuously respond the best to Change. Changing intensity, rep ranges, angles, resistance and exercise movements to develop a full complete upper, lower, inner and outer chest; are all things that will play a big part in the speed in which you build your ultimate chest. Keeping it simple: so many guys that are newer to weight training including many advanced level lifters, fall into this rut of trying to essentially; reinvent the wheel with a whole myriad of chest training exercises. Because, the shoulders and triceps come into play so heavily, it just isn’t necessary. Prioritize: constantly keep an eye on your chest as time passes, see where weaknesses begin to show themselves. As your chest develops from your training make these weaker areas your new priority. Focus on these areas and go after them tenaciously and you will develop a full well-rounded chest. Bring yourself mentally, deep into the chest muscles, feel them pulling/pushing and squeezing on every repetition. Making a constant, conscious effort to stay in tune with these muscles effectively removes some stress from the triceps and shoulders allowing you to focus on the areas of the chest your trying to stimulate. In time-serious lifters learn... it’s not about the amount of weight, or how you heave it! It’s about moving the weight under control, keep the movements smooth and make an effort to squeeze. Use the info here repetitively and make your efforts count in - building chest size.